Playing Epic’s building-forts-and-killing-zombies game, Fortnite? If you’ve bought the game’s early access version and suddenly feel a bit overwhelmed, don’t worry: there’s a lot going on in Fortnite, but it’s not as complicated as it all looks. 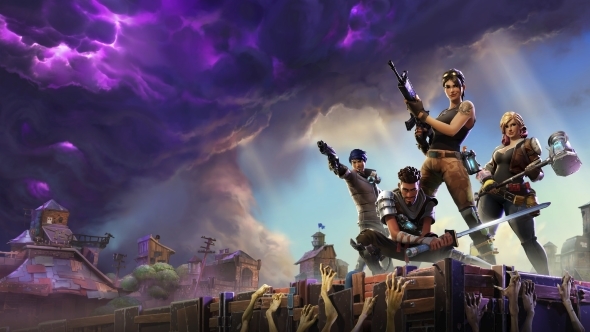 Our Fornite Save the World guide will help you out with understanding how the PvE mode’s characters, loot, quests, and weapons all work. Playing the PvP mode? Check out our Fortnite tips for Battle Royale. 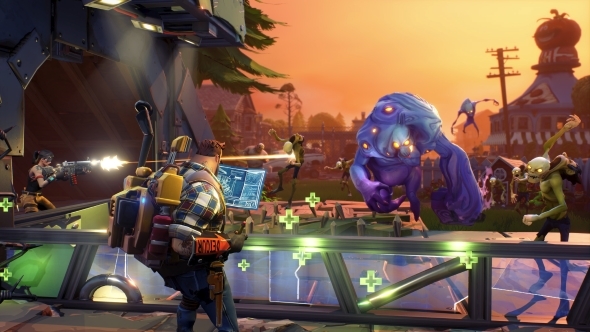 Fortnite’s heroes are split into four classes: soldiers, constructors, ninjas, and outlanders. While, on the whole, every hero class is pretty good at everything you need to do in Fortnite, each one has a specific set of skills you may find makes playing them more enjoyable if you make use of them. Soldiers are focused on multi-purpose damage dealing, with bullets that debuff enemies, and the ability to throw grenades and place mines. Constructors can build structures faster and more cheaply than other classes, and are able to shrug off more damage thanks to a larger health pool. Ninjas are the fastest, most nimble characters, and are well suited to melee combat thanks to their sword combo perks. Outlanders are scavengers, best used for finding the rarest items. They find treasure chests easier than other classes, and the quality of loot inside will be better. You don’t lock yourself into a hero in Fortnite; you can swap between any you own before a match starts, so consider what you want to achieve on a game-by-game basis. Running short on supplies? Play one of your Outlander heroes. Hoping to build and epic castle? Go with a Constructor. There is more to heroes than simply picking one to play. 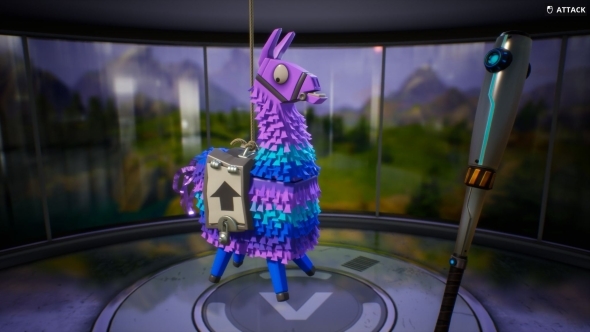 Heroes are found in llama pinatas (Fornite’s adorable answer to the loot box), and come in the classic rarity tiers of uncommon, rare, epic, and mythic, just like weapons do. Better graded heroes start with higher stats and can learn additional abilities beyond those of their lower-ranked alternatives. To upgrade your hero and gain access to new perks and abilities you’ll need to level them up. Rather than gaining XP through kills and objectives akin to typical RPGs, you instead get hero XP chips in loot boxes. These provide you with a pool of resources to spend on any hero you fancy. This allows you to upgrade a hero you’ve yet to use with the XP you’ve acquired with a more seasoned character. A character can initially be levelled up to level ten. To progress further you’ll need to evolve your hero, using a combination of rare items, XP, and a training manual. These elusive manuals are time consuming to get as they require a hero to be retired. To explain, upon hitting the level cap and maxing out your hero’s potential, you can ‘retire’ them. This is, essentially, exchanging your heroes for special items, including a training manual. You’ll lose that hero forever, though, so be sure it’s the right decision before you send them out to pasture. 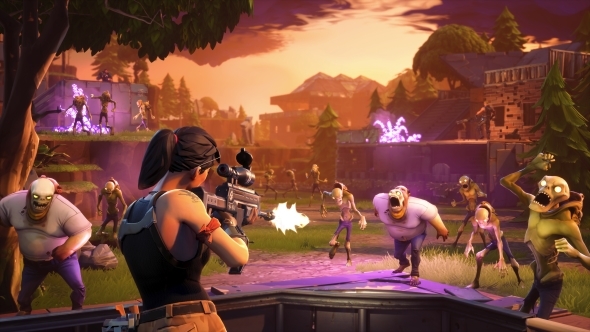 There are a variety of quests in Fortnite, but they’re all based on the same set of basic principles: find the defense point and protect it from hordes of zombies. This means every quest is split into two phases, with a variety of things to do in each. At the start of a quest you’ll be beamed into a procedurally generated world without a clue as to where your objective is. Lucky for you, the zombies won’t get aggressive until you find and activate the objective, which means you’ve got plenty of time to leisurely explore. And you’ll certainly want to, since every map is a brimming with riches. The core thing you’ll want is crafting materials, used to build both your fort and any weapons you may need. Take a look around you at any point in a game and you’ll see dozens of material opportunities. Pretty much everything in Fortnite can be destroyed and turned into materials, be it a tree, a car, or an entire house. Smashing away at these things will add wood, brick, and metal to your inventory. This inventory carries over from game to game, so if you’ve got plenty in stock you won’t need to harvest resources at the start of every quest. Wood, brick, and metal is used for the basic building blocks of forts, but you’ll need component pieces in order to create things like weapons and traps. Searching things like drawers and cupboards in houses will provide these, while more complicated structures like cars will also drop components when smashed. The drop rate is pretty low, though, so be sure to smash and search frequently in order to keep your supplies topped up. On your collecting travels you should also be on the lookout for survivors. As you draw near them you’ll be able to hear their panicked calls. Find them and you’ll beam them back to your base. We’ll discuss their uses later on. Be on the look out for treasure. There’s an audio cue when you’re close, and the chests are full of valuable components. Demolish houses. There may be treasure-laden caves beneath the floorboards. Play whack-a-ghoul. If you see a little purple ghost popping out of a portal in the ground, go bop him on the head. You’ll be rewarded with a handful of loot. Similarly, if you see a radar tower blueprint, fix it up. You’ll get a reward, plus the radar will pinpoint the location of things like survivors or treasure on the map for you. You’ll spot the occasional zombie hanging around during this phase. They sleep in the day, but will be more active at night. Just be wary of the day/night cycle. Scouring the map for goodies should have led you to the defence point. This can be a landing zone or an ATLAS generator, among other things. This it what the zombies will be attacking, and if it explodes it’s mission over, so be vigilant. You’ll need BluGlo to power up whatever you’re defending, which can be easily spotted while exploring the map. Don’t spin the objective up just yet, though; you need a fort first. Forts are very easily constructed using a combination of walls, floors, stairs, and roofs. The edit tool lets you punch out squares from the 3×3 grid, allowing you to easily make doorways, windows, chest-high walls, narrow stairs, and arches. From simple shacks to elaborate castles, you can pretty much build anything. Remember, though: it needs to be practical. You need to fend off the incoming waves of undead. Consider what angles zombies could approach from, and what your line of sight is like. Perhaps you’ll need a tower so you can get some height and snipe? Build around the requirements of the specific map. Think about zombie behaviour, too. They run straight for your fort, so building a maze of walls before they make it to their target will slow them down significantly. Place floor traps like spike pits in front of those walls, and while the zombies are attempting to tear down your structures they’ll be constantly attacked by your traps. Oh yeah, traps. You can fill your fort with all kinds of deadly devices, from simple wooden spikes to tesla coils and dart launchers. They require several non-standard components (hence why it’s important to search everywhere before you build), and so will feel considerably expensive during your early Fortnite career when your stocks are low. When you’ve got a well-prepared fort constructed, drop some BluGlo in the McGuffin you’re protecting to summon the zombies. Don’t get complacent during the fight; be sure to continually maintain and adapt your fort. If zombies start hurling projectiles over your walls and onto your objective, you can always build higher walls, or add a roof. Walls can be quickly repaired with a tap of a button, too, which is faster than rebuilding them from scratch. Don’t go mad during the early hours of the game. The quests are easier at this stage, and building elaborate forts and traps will be a waste of resources that you’ll certainly need later on. If a tree or building is blocking your line of sight, knock it down. Pretty much everything apart from the ground is destructible in Fortnite, so don’t let anything block your view. Rely on human teammates, not AI-driven defenders. After a few missions you’ll be able to assign an AI defender to your fort, but they require you to provide them with a weapon and ammo. They chew through ammunition like there’s no tomorrow, which makes them an inefficient use of your precious resources. Hold R to craft new ammunition if you run dry. You’ll need nuts and bolts, which are generally easy to find if you smash up metal items like cars and machines. Fortnite is a loot-driven game. There are two key methods in which you earn new goodies: loot chests and llamas. The most basic loot comes from chests – these are awarded at the end of every quest. The chests are ranked, and the better you do during a quest, the higher tier of chest you’ll be given. Completing optional objectives in a quest, such as building radio towers, or completing in under a set number of days, will increase the amount of XP you earn, and thus the quality of loot chest awarded. Loot chests are filled with basic staples; things like materials for crafting, XP chips for upgrading heroes and items, and survivors to populate your squads with. The best stuff comes from llamas. These are pinatas stuffed full of top-notch gear, from weapon and trap schematics, to new heroes, defenders, and more XP chips. There’s a random roll effect that may cause your llama to upgrade to a silver or even gold pinata, enhancing the chances of getting much better loot. Unlike loot chests, llamas must be bought. The standard ones cost 100 Vbucks each. Fortnite’s in-game currency can, like other games, be bought with real cash, but also earned through play. For the first ten levels of the game you’ll earn this pretty regularly, but beyond that you’ll need to be sure to do the daily quests to maintain a steady blow of Vbucks. 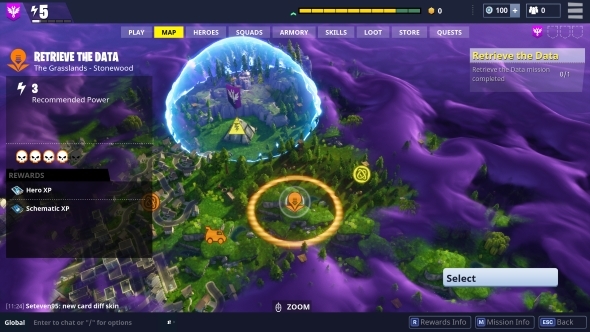 Fortnite has several progression systems and core among them are your skill trees. By unlocking nodes in these webs you’ll gain new abilities, such as the chance to use AI defenders in battle, and upgrade your basic stats. You’ll often see reference to your F.O.R.T stats (fortitude, offence, resistance, and tech). These reflect, respectively, your health, damage, shield, and technologies. Unlocking nodes on your skill trees that increase your F.O.R.T stats will provide an overall boost for your heroes. Improving tech, for example, will boost the damage done by traps you place, regardless of which hero you use. There are two upgrade paths, each with a unique manner of progression. 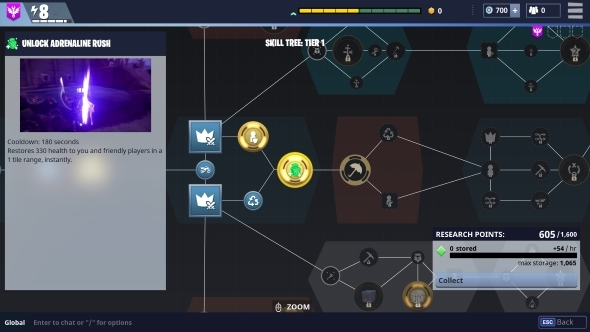 The skill tree, focused on notably beefy additions like new active abilities and chunkier stat boosts, uses skill points earned through XP gained at the end of quests. The better your performance in a quest, the more experience points you’ll gain. Fill the XP bar and you’ll pick up a point to spend. The research tree is more of a trickle effect, gradually pushing extra points into your core F.O.R.T stats. Upgrades are purchased using research points, which slowly accumulate every hour. Be sure to regularly spend these as there’s a cap to how many research points you can store at once, and so you’ll stop earning them if the pot is full. As you play Fortnite and unlock loot chests and llamas, you’ll gradually amass a pool of survivors. Each survivor has their own set of stats and can band together to form Survivor Squads. These teams offer another way to improve your F.O.R.T statistics, allowing you greater health pools, increased damage, improved shields, and enhanced technology. Your survivors can create eight different squads, although you’ll need to gradually unlock the slots for these over your career. Each different squad improves a specific F.O.R.T stat. For example, the EMT Squad will improve fortitude, for both yourself and your co-op team. 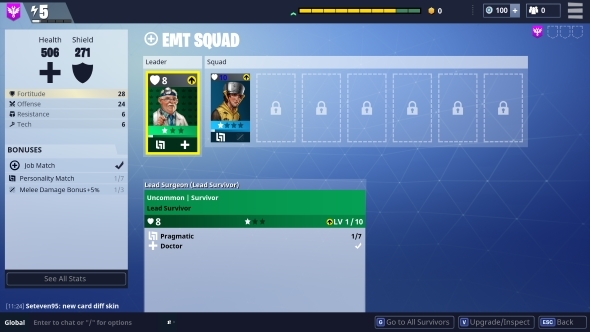 Survivors come in many flavours, and while all of them can be assigned to any squad, it’s best to find people who are best suited to the job. For example, doctors are ideal for the EMT squad, and will provide a better bonus than a non-qualified survivor. The menus will flash green if you’re slotting a well-suited survivor into a squad. Defender Squads are made up of AI Defenders, who can be summoned into battle during your quests. Defenders come in five varieties, and are designed to use specific weapons: snipers, shotguns, pistols, assault rifles, and melee. Consider the kind of support you want, and arrange the squad accordingly. Expedition Squads are teams that head out on missions to gather resources. Importantly, the people who make up these squads are hero characters, not survivors. Each mission has a difficulty rating and a power requirement. Easier missions may be achieved by a single hero, while others may require you to send two or three. Heroes will be out of action for a while as they complete the task (often for more than an hour), but if they return successful they will add a bounty of new materials to your stocks. Expedition missions also require vehicles, which are unlocked on the skill tree. Your armoury is where you keep your guns and traps. Or, more accurately, where you keep your schematics. Schematics, which are found inside llamas, are the recipes you use to craft new items. Once you’ve found a schematic you can craft the item as many times as you want, provided you have the required materials. Crafting is done during quests, so don’t worry that you can’t see your hero’s inventory on the armory main menu. Your account can only hold up to 250 schematics at one time so be sure to effectively manage them. Because one schematic can be used over and over, there’s no need to have duplicates, so be sure to get rid of those. If you’ve got a higher ranked version of a schematic, you probably won’t need their lesser versions, so you rid yourself of those too. An effective way to free inventory space is to put duplicates in your collection book; this removes them from your inventory for good, and will reward you with new items. Like heroes, schematics can be levelled up. Higher level schematics produce improved items with better stats. Simply use your pool of schematics XP chips to upgrade your recipes. 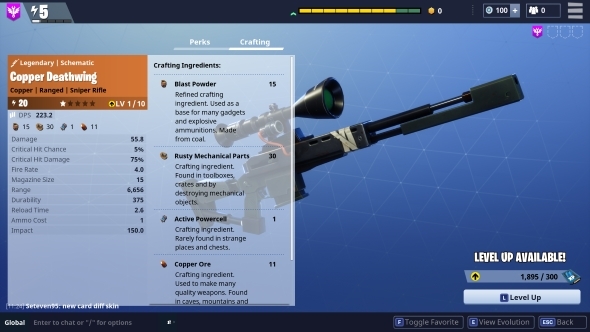 Do put thought into where you place your XP; it’s likely not worth using XP on common schematics when they could be put to better use on legendary or epic weapons. When in-game, you will find that your weapons degrade as you use them. Don’t allow them to break through – any weapon that is about to fail should be recycled. A broken weapon will simply disappear, you see, while recycling even heavily damaged ones will yield valuable crafting resources. Be wary of your in-game hero inventory, too. You can only hold up to 50 items so you should keep it down to the essentials. Be sure to recycle any old weapons you’re no longer using. Don’t have a bag full of traps, either; you’ll typically lay traps during the more relaxed preparation phase, and so can afford to spend a little time making new ones specifically for the situation. Traps are expensive to build, and only crafting exactly what you need will preserve your resources and keep your inventory tidy. That’s everything you need to know to get started in Fortnite Save the World. The layers and layers of menus should make sense now, and you definitely know your loot chest from your llama. Good luck in your fight against the undead husks!